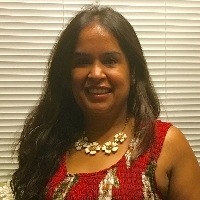 Hi, My name is Manisha and I am a Licensed Marriage and Family Therapist based out of California. My style of counseling is empathetic, non-judgmental, and patient. I feel our lives have patterns starting from childhood and I hope to uncover some of those patterns in your life. Also, we tend to live in a very fast past world and with a lot of images of how we should be. I try to help you uncover your true essence and for you to gain self compassion and love. It is to help you gain that secure sense of self. As a teenager, I used to like to go online and chat and I feel that virtual communication helps sometimes create that sense of safety which maybe harder when your meeting someone face to face and your anxiety might kick in. I utilize many modalities but I feel in a virtual platform, empathy, cognitive behavioral therapy, guided meditations, and solution focused is most applicable. Would you like to write a review for Manisha Chulani? We'd appreciate if you can spend a couple of minutes to write a short review for Manisha Chulani (MS, LMFT, PPS). This review would be shared with Manisha Chulani. It may also be posted in our website or in Manisha Chulani's profile but it would be anonymous and your identity would be kept completely confidential.